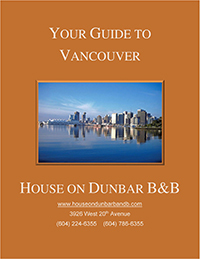 Staying at a Vancouver bed and breakfast would certainly not be the same without trying out one of many of Vancouver’s renowned and delicious restaurants. Vancouver is definitely a food city; you can hardly walk a few blocks without going past at least a restaurant or two. La Notte: Only 5 blocks away from the House on Dunbar, La Notte is a popular Italian restaurant that specializes in pasta and veal. Their well-known osso bucco is served every Friday night. Jethro’s Fine Grub: Recently featured on the Food Network, Jethro’s is great for breakfast, brunch and lunch. The amazing variety of breakfast and brunch dishes is sure to satisfy even the pickiest eaters. Their pancakes are especially popular. Provence Mediterranean Grill: Provence has been a part of West Point Grey for 15 years, and still cooks some of the best French and Italian food in Vancouver. Try the tarte au citron for dessert—a truly authentic family recipe. Enigma: Enigma carries on the comfort pub food tradition with a truly homestyle menu featuring cheesecake and stew. This unique neighbourhood pub is known for its delicious and affordable food—a rare combination these days. Browns Social House: One of the more recent Vancouver-born restaurant chains, Browns Social House has distinguished itself with a social atmosphere in a comfortable setting. It’s a great spot for a casual West Coast fusion dinner between friends, or for a romantic date.